I need a display created with our beverages on it. The attachment "hydra-guard display" Needs to be blue like the "IMG 1567". The banner 18x12 needs to be above and the 11x 20 needs to be vertical long the side. 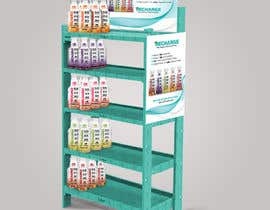 The stand color needs to be blue and I'd like our shelves filled with our beverages (each shelf a different flavor"
Hi, I'm bit confused that if you are looking for 3D renderd display stand or the creative/display board which will display all the bottles? hello are you need same this hydra-guard display ? ?